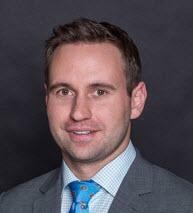 T.J. Matthes is an associate with the firm. T.J. received a Bachelor of Arts from The Ohio State University in 2011 with a major in Political Science. T.J. received his juris doctorate degree from Saint Louis University School of Law in 2014, where he worked in the Criminal Defense Clinic. T.J. began working as an intern with Rosenblum, Schwartz, Rogers & Glass in 2013. He was admitted to practice in Missouri and the United States District Court for the Eastern District of Missouri in 2015. T.J.'s primary area of practice is criminal defense.